← Book Cover Design Contest! I’m very excited about the cover design options! Please vote for your favorite design by commenting on this blog post. Choose Design A or Design B. You may vote one time. Voting will close on June 2, and the winning design will be announced June 4. You may also vote on my Christian Compositions Facebook page. This entry was posted in Christian Composition Updates and tagged classroom of contentment, cover design contest, favorite cover, vote. Bookmark the permalink. 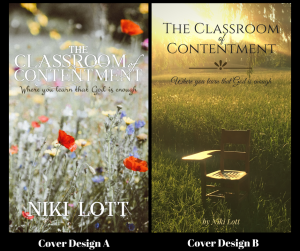 3 Responses to Vote for Your Favorite Book Cover! I vofe B 😉 It looks so peaceful. We vote for B. We think it coordinates with the theme of the book better. B……it looks so peaceful, alone with The Savior. To pour out ones heart to the one that gives so much love.